Highcon’s new Direct-to-Pack solution for folding cartons can complement the Xerox® Automated Packaging Solution which includes the Epic CTi-635 In-Line Coating System and Stora Enso Gallop™ Buffering Stacker Line and DC58 Die Cutter. 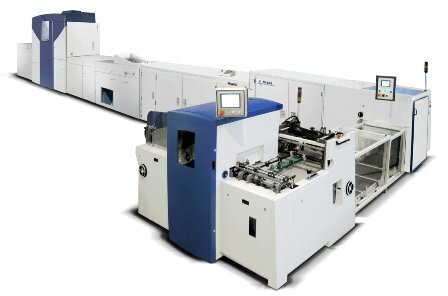 This digital folding-carton cutting and creasing solution offers efficiencies to converters looking to extend digital technology into the finishing process. The Israeli-based company was delighted to have worked together with Xerox Corporation to perform digital cutting and creasing on folding carton packages printed on the Xerox iGen4™. Highcon logoPowered by Highcon’s patent-pending Digital Adhesive Rule Technology (DART) the Highcon Euclid uses precision laser optics and polymer technologies to transform cutting and creasing from an analogue to a digital workflow. The result, says Highcon, is a dramatic streamlining of the finishing process which offers brand owners and converters faster and more responsive delivery, increased versioning, shorter run lengths and more creative designs. Xerox iGEN4 and automated packaging solution 2Folding carton samples that prove the design flexibility and creativity required by today’s market will be shown at the companies’ respective booths at May’s drupa show in Dusseldorf, Germany.